And I couldn't be happier! Title is a little misleading I know. You were expecting me to tell you all about how I hate my life now and it's all because of the horrible oppressing expectations of APing. See here is the thing, I feel that APing actually set me straight. Hear me out. So I kinda felling into APing. Ravebaby was about a year old before I even knew my style of parenting was AP. I had hear so many negative things about AP that since I was so happy I could not possibly be an AP parent. How did this journey into AP parenting begin? Well I got pregnant and decided to breastfeed. It all starts there. I gave birth to Ravebaby at exactly 38 weeks after having my water broken for about 72 hrs. I had her at home so our first nap was with her on my chest in my bed. That is how I got hooked on co-sleeping. She was so small and every time I would put her in her bed she would cry. It broke my heart so I just kept her next to me. I found it made my life easier too once I returned to work since Ravebaby reversed her nursing pattern. With her in the bed I could nurse her all night and still get some sleep. The baby wearing came from not wanting to lug a stroller and wanting Ravebaby close. It was just so much easier to put that baby in a Moby wrap and go. She was about 8 weeks old and I've been collecting babywearing gear ever since. Being a delayed vaxer came from research, a gut feeling, and Ravebaby's reaction to her first round of vaccines. How can I force my baby to take shot after shot and suffer for the next few days at such a young age? We are not totally anti-vax. Just delayed and spaced out. So on to how it ruined my career. I listen to Ravebaby. I take the time to bond with her. I was a full-time working mom since she was 6 weeks old. I felt like I gave everything I had at work and would be just a shell for Ravebaby. I was in a job I hated working for someone that didn't seem to really want me there so I made the decision to be a mom first instead of a librarian. It was not an easy transition for me. It's been very difficult financially but I wouldn't have it any other way. I am watching Ravebaby grow and learn. I have a part-time job that helps with the bills and keeps me from going nuts from a lack of adult conversation. But when I get home after 5 hours, I have energy for my child. We sing silly songs. We paint. We nurse. We play in the iPad. I get to raise my child. I do miss library work. When I get ready to go back at some point in the future I'll have a huge gap in my resume. I am cool with that because I also hope to have a daughter that is happy, healthy, and productive. APing has ruined my career and I thank God for it. 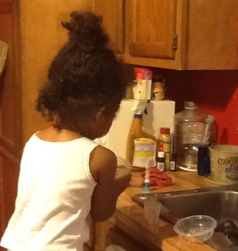 Just a picture of Ravebaby washing dishes. Yes it's messing and gets nothing clean but it's fun and she's learning. I really love my life. That's awesome! I love when kids naturally want to do things around the house Little Lady is in the I need to wipe everything down It's cute!